Gamers clamored. Gamers pleaded. Gamers cast 148,578 votes on Xbox.com to make it happen. 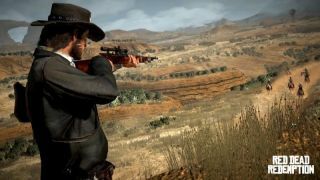 Now, over a year after Microsoft enabled backwards compatibility on Xbox One, Rockstar Games has announced that it's bringing one of its most well-loved titles, Red Dead Redemption, to Microsoft's powerhouse gaming system. Xbox 360 owners will be able to play the game directly on their Xbox One, regardless of which version of the game they own (Red Dead Redemption, Undead Nightmare and/or the Game of the Year Edition), starting on Friday, July 8. While the game briefly made it to the Xbox One via the backwards compatibility program in February, Microsoft pulled a quick 180 and disabled the game saying that it was merely a public test and that it wasn't ready for public consumption. The difference between today's news and that public test back in February is that today Rockstar approved Red Dead Redemption for the backwards compatibility program, rather than Microsoft covertly making it available. So why did Rockstar choose today to make it happen? Is it because Rockstar has plans for a Red Dead Redemption HD Remake? Or is it ready to unveil RDR's long-rumored sequel? We can't say for sure, but the fact that Rockstar has already shown us the map for Red Dead Redemption 2 indicates that the latter is, at some point in the near future, very likely. We also found out that Rockstar is already working on the next game in the Grand Theft Auto series, Grand Theft Auto 6 and, at least briefly, considered using Tokyo for a separate game's setting. While today's news will undoubtedly make some gamers happy, unfortunately, if you've been waiting for a PC port you might still have awhile to wait.